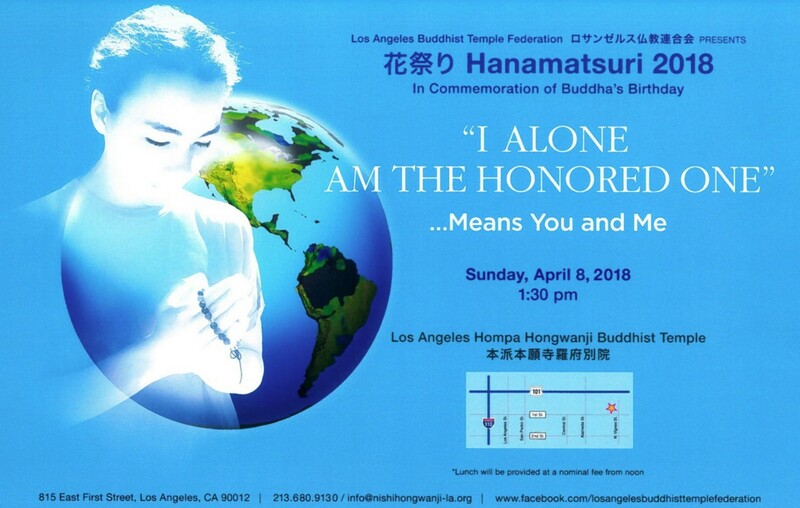 The Los Angeles Buddhist Temple Federation, consisting of eight local temples (Higashi Honganji, Jodo Shu, Koyasan, Long Beach Buddhist Church, Nichiren Shu, Nishi Hongwanji, Senshin, and Zenshuji), annually observes a special service called Hanamatsuri to celebrate the Buddha’s birth. According to several legends, Buddhist followers celebrate the birthday of Sakyamuni Buddha, the founder of Buddhism, by pouring sweet tea upon the top of the baby-Buddha statuette, ornamented by colorful flowers, and the service featuring this ritual is called Hanamatsuri, which means the “flower festival” in Japanese. This year’s Hanamatsuri, titled “I Alone Am the Honored One,” will take place on Sunday, April 8, from 1:30 p.m. at Nishi Hongwanji Buddhist Temple, 815 E. First St. in Los Angeles, and will feature “FandangObon,” an intercultural dance created by Japanese American artist Nobuko Miyamoto. A Dharma message will be delivered by Rev. Masao Kodani, BCA (Buddhist Churches of America) minister emeritus.